The electrochemical noise of a commercially produced Li-ion battery was measured during discharge by means of a constant value resistor using two approaches: continuous discharge and discharge with interruptions. Power spectral density and standard deviation calculation techniques were applied to analyse the electrochemical noise behaviour for different states of charge values. It was shown that electrochemical noise does not disappear immediately following load removal. Noise decreases in amplitude for several hours, reaching the thermal noise level afterwards. 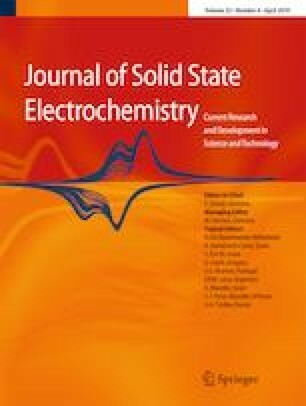 Unfortunately, it is not likely that the described electrochemical noise measurement and analysis method can be used for practical state-of-charge estimation of the batteries of investigated type due to the majority of changes in electrochemical noise behaviour taking place at the very end of the discharge process regardless of discharge technique. Nevertheless, the novel load-interrupt realisation of electrochemical noise measurement provided some new interesting insights into the electrochemical noise-generating processes in rechargeable batteries. It was shown that the electrochemical noise measurement technique can be used as a means of detecting over-discharge for Li-ion batteries. The same load-interrupted measurement result was also obtained in continuous discharge mode. This work was supported by the State Task of the Russian Federation (State Registration No. 01201361853).